Microwave mixers translate the frequency of electromagnetic signals. The mixer is the determining factor in the dynamic range of many systems, particularly receivers. The dynamic range can be limited by the conversion loss, multitone intermodulation products, single tone spurious products, and isolations of the mixer. Marki has a continuing legacy of creating the highest performance RF and microwave mixers in the world. Mixers are differentiated by their circuit topology (single/double/triple balanced, T3, etc), device (Schottky diode, MESFET, etc. ), and their form factor (module, surface mount, chip). Marki uses traditional and proprietary circuit topologies to create hybrid, Microlithic® and MMIC mixers. Our packaging options include chip/bare die, surface mount and connectorized form factors. 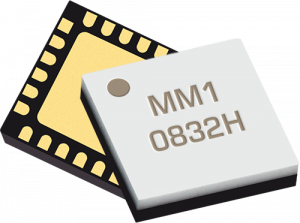 Our surface mount MMIC mixers feature optimized chips packaged into industry standard ceramic QFN. These affordable packages offer good electrical performance to 30 GHz while also providing proven high reliability. Surface mount Microlithic® mixers are based on chip designs, but use integrated surface mount transitions that operate up to 32 GHz. Eval modules of both MMIC and Microlithic® surface mount mixers are available. These mixers offer the best tradeoff between performance, size, repeatability, cost, and lead time/availability, particularly for higher volume applications. 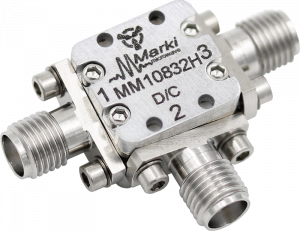 Marki develops MMIC and Microlithic® mixers using full electromagnetic and circuit based non-linear optimization. Our MMIC mixers are fabricated with precise tolerance on a GaAs substrate with high speed Schottky diodes. Marki MMIC mixers offer superior non-linear performance and isolations compared to both competing MMIC mixers and hybrid mixers. Microlithic® mixers offer low, repeatable conversion loss performance. Our MMIC/Microlithic® bare die/module mixers are designed as a small form factor chip. This chip is also packaged into a module that is suitable for high performance laboratory use or as an eval module with equivalent performance as the bare die. The T3 mixer is the most advanced mixer circuit available in the world. In addition to broadband overlapping LO, RF, and IF bands, it has the potential for extremely high linearity. T3 mixers are built in both hybrid and MMIC form. The hybrid construction allows for ultra-broadband coverage on all three ports (RF,LO, and IF). The MMIC form, or MT3, offers the scalability and repeatability of a MMIC with the linear performance of the T3. Since it is a true-commutating mixer, it will provide increasing two-tone intermodulation suppression, input 1-dB compression, and spurious suppression (for most spurs) as the rise time of the LO signal is increased by either increasing sine wave LO drive or using a square wave LO. Much more detailed information about the T3 can be found in our T3 Tutorial. Marki’s legendary hybrid mixers offer low conversion loss, high isolation, and low LO drive capability across incredible bandwidths. While they have been surpassed in nonlinearity performance by T3, MMIC, and Microlithic® designs in smaller form factor chip and surface mount packages, legacy mixer connectorized modules are still a sound choice for legacy systems and laboratory use.